Mineral Water, Ethyl Macadamiate, Cyclopentasiloxane, Dimethicone, Zinc Oxide, Cyclohexasiloxane, Cetyl PEG/PPG-10/1 Dimethicone, Butylene Glycol, Mica, Calcium Aluminum Borosilicate, Polyethylene, Polyglyceryl-4 Isostearate, Water, PEG/PPG-18/18 Dimethicone, Smithsonite Extract, Malachite Extract, Rhodochrosite Extract, Glycyrrhiza Glabra (Licorice) Root Extract, Retinyl Palmitate, Alpha-Arbutin, Helianthus Annuus (Sunflower) Seed Oil, Glycerin, Ethylhexylglycerin, Tocopheryl Acetate, Tetrahexyldecyl Ascorbate, Tocopherol, Aluminum Hydroxide, Alumina, Dimethicone/Methicone Copolymer, Dimethicone/PEG-10/15 Crosspolymer, Disodium Cocoyl Glutamate, Disodium EDTA, Dimethicone/Polyglycerin-3 Crosspolymer, Hexyl Laurate, Magnesium Sulfate, Malic Acid, Polysorbate 20, Sodium Chloride, Sodium Cocoyl Glutamate, Synthetic Fluorphlogopite, Sodium Citrate, Trimethylsiloxysilicate, PEG-32, PEG-10 Dimethicone, Silica, Hexylene Glycol, Dipropylene Glycol, Caprylyl Glycol, Phenoxyethanol. May Contain Titanium Oxide, Iron Oxides. Directions: Apply pressure onto cushion with puff applicator to release the perfect dose of foundation for customizable light to medium coverage. Gently pat puff onto skin. 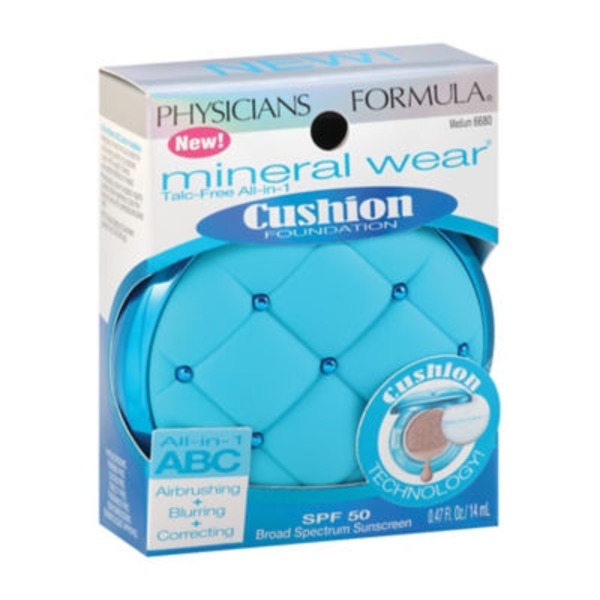 Flip cushion for extended foundation usage. Close inner lid tightly to prevent product from drying out.